-Surprise! Jonathan Quick left the ice first and will be expected to draw the start against San Jose. He’s 15-11-5 with three shutouts, a 2.52 goals-against average and a .910 save percentage in 33 career games against the Sharks, all starts. Jaret Anderson-Dolan and Paul LaDue were the extras and are not expected to be in uniform beyond introductions. (Speaking of which, puck drop is scheduled for 7:46. Pre-game hype and introductions begin at 7:31.) Tonight’s officials are referees Frederick L’Ecuyer and Marc Joannette and linesmen Brandon Gawryletz and Darren Gibbs. Please also keep in mind that the post-game Kings Talk will air earlier on the LA Kings Audio Network than it had previously aired on terrestrial radio. You’ll want to turn on the audio network as soon as you get in the car, as Kings Talk will begin approximately eight minutes after the end of the game, from my understanding. -The them: Expect San Jose to roll with Meier-Thornton-Pavelski, Hertl-Couture-Labanc, Kane-Suomela-Donskoi and Sorensen-Goodrow-Karlsson up front and with defensive pairings of Vlasic-Karlsson, Ryan-Burns and Dillon-Braun. Martin Jones will get the start in goal. Though he let in four goals on 18 shots in San Jose’s opening night 5-2 home loss to Anaheim, he’s 9-3-2 in his career against Los Angeles with a 2.06 goals-against average, a .931 save percentage and one shutout. By playing his 1,495th game tonight, Joe Thornton will tie Phil Housley for 20th place on the NHL’s all-time games played list. -Austin Wagner will make his NHL debut tonight in front of his mom, dad and brother, who made the trip from Calgary. The 21-year-old selected in the fifth round in 2015 has some of the purest straight line speed in all of organized hockey and totaled 10 goals and 17 points in 50 games during his debut 20-year-old season in the AHL last year after returning from off-season surgery to correct a torn labrum. Is he feeling any nerves on the precipice of his NHL debut? But Wagner showed tremendous grit in pushing through his injury and contributing with two of his 16 goals during a series against Seattle that the Pats dropped in six games. This, of course, is an entirely different animal, what, with future Hall of Famers Joe Thornton and Erik Karlsson on the opposite end of the ice. In the end, he’s playing a game, and isn’t trying to write too grand of a script beforehand. Erik Karlsson will draw the requisite headlines as he inserts himself into the rivalry for the first time, but this is actually Los Angeles’ first game against San Jose since the Sharks acquired Evander Kane, as well. These teams last met on January 15, and both have undergone – as many teams have –significant personnel changes. In addition to Kane and Karlsson, this will also be Ilya Kovalchuk and Dion Phaneuf’s first installments in the rivalry; Nate Thompson had a preview of the league’s California rivalries while playing for Anaheim. 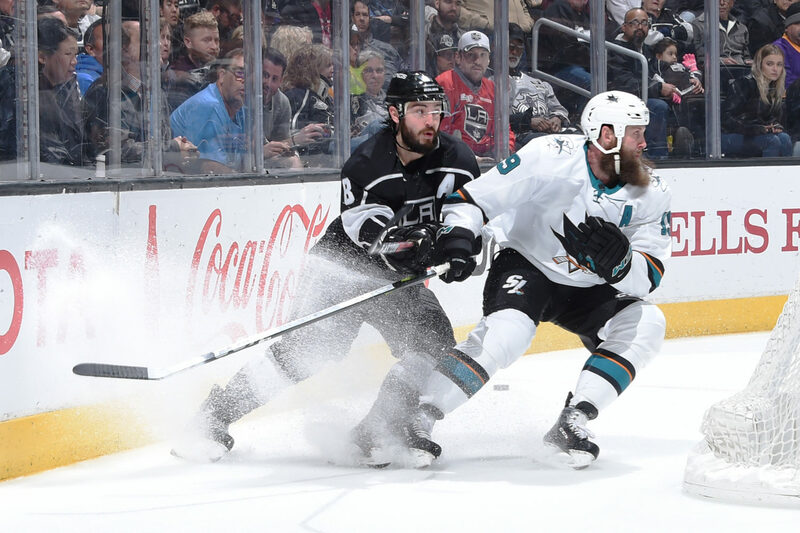 While the names from the Sharks’ end scream offense, they’re still a heavy forechecking Pacific Division team that remains one of the most difficult groups in the league to generate opportunity against from the center of the ice. Structurally, the Sharks should be a similar team, as Stevens noted. They’re also a deeper team with the aforementioned reinforcements. Their typically excellent power play rebounded to a respectable 20.6% that ranked in the dead center of the 31-team league last season. San Jose ranked 25th the year prior but has finished above 20% in nine of the last 12 years. Related: Erik Karlsson ranks ninth in the league since 2010 with 185 power play points. That’ll be a challenge, given the traditionally whistle-heavy nature of early season NHL hockey. Los Angeles ceded 15 power play opportunities over the first three games last season, which is basically par for the course, regardless of team. A major key tonight will be to get out to a good start and not take early penalties. Is it a challenge after ceremonies and with irregular start times to get off to that good start? “It didn’t affect Washington the other night,” Stevens said. -Jonathan Quick’s new mask, as designed by Steve Nash of Eyecandyair, is below. Several of the subtle changes are noted by Steph in the commenting, while a side-by-side juxtaposition of the two masks Quick will wear this season show off the differences.